The Aberwheeler War Memorial commemorates those men of the area who died during World War I and World War II. Aberwheeler (Welsh: Aberchwiler) is a rural community in Denbighshire. It is part of the ancient ecclesiastical parish of Bodfari, which comprises the townships of Bodfari, in historic Flintshire, and Aberwheeler, in historic Denbighshire. Between 1974 and 1996 the area was part of the county of Clwyd. (Territorial Force) 28 Aug 1915 27 Son of John & Anne Davies, of Geinas Mill, Bodfari. Helles Memorial, Turkey. 5411 Cheshire Regiment (2nd Bn.) 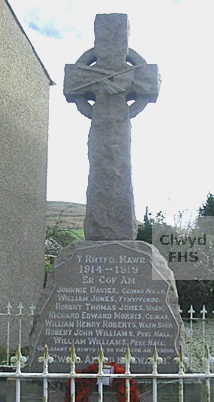 1 Aug 1915 38 Son of Abram & J Jones, of Waen, Trefnant, Bodfari. Wimereux Communal Cemetery, Pas de Calais, France. ("B" Coy. 16th Bn.) 17 June 1917 20 Son of Thomas Charles & Jane Morris (nee Jones), of Geinas, Bodfari. Bard Cottage Cemetery, West-Vlaanderen, Belgium. 49795 1st Bn. Cheshire Regiment 22 Nov 1916 20 Son of Mr John Edward Mary Roberts, Waen Shop (formerly of 20 Beaconsfield Road, Liverpool). Le Touret Military Cemetery, Richebourg-L'avoue, Pas de Calais, France. (1st Bn.) 5 Sep 1916 25 Son of William and Sophia Williams, Peel Hall, Aberwheeler, Trefnant. Thiepval Memorial, Somme, France. (2nd Bn.) 29 Jan 1917 24 Of Peel Hall, Aberwheeler. Son of the late William & Sophia Williams, Peny Court, Bodfari. Bray Military Cemetery, Somme, France.